Dubai has become one of the world’s most sought after places for foreign investors. In the last few years there have been changes to the law which have made Dubai freehold property available to foreign investors. It is now fairly easy to purchase real estate in Dubai, subject to the usual conditions such as the ability to finance. Always get expert advice to help you negotiate the local laws and regulations in this booming middle east country. Determine what type of property you are interested in. Foreign buyers often choose to purchase either apartments, townhouses, or villas, which are generally located in secure complexes with elaborate leisure facilities such as tennis courts, swimming pools and gyms. In 2002, by royal decree, foreign nationals became eligible to buy and own property in Dubai. Start your search online. As with any property search, a good place to start is online. There are numerous agencies and real estate agents that list properties for sale in Dubai online. You can buy properties through a real estate agent or direct from a developer. Real estate agents generally sell resale properties, which are properties that have been built and have previous owners. Developers sell pre-construction properties off of a plan, and these may be prior to any construction, or still under-construction. Contact a local real estate agent. If you want help with your search, you will need to speak to someone with specialist local knowledge about the property market in Dubai. It’s always best to employ a real estate agent to work with, as they can help you to find properties and explain your options to you. Big real estate companies are used to dealing with foreign buyers and will speak English. In Dubai, the buyer pays the real estate commission; you can expect to pay a fee of between 2% and 5% of the value of the property. You should always check the credentials of anyone you hire. The regulatory body for Real Estate in Dubai is the Real Estate Regulatory Agency (RERA). Attend property fairs. 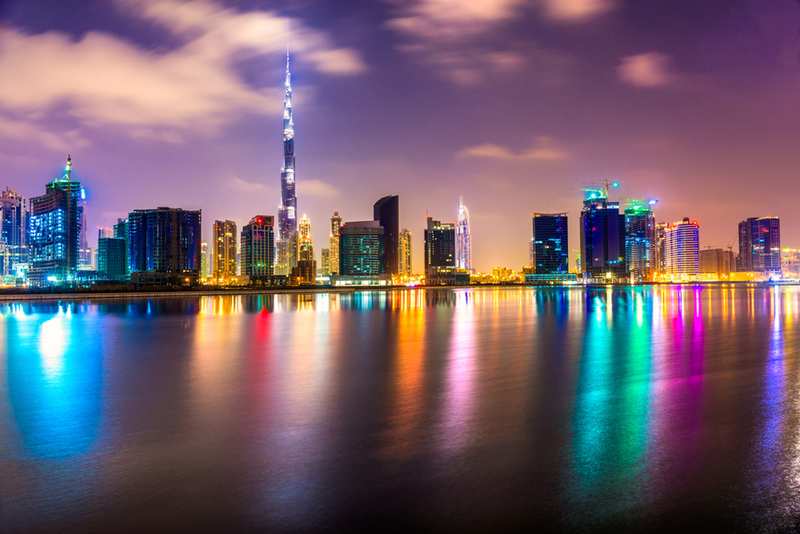 The property market in Dubai is still relatively young, although growing fast. As a result, a significant amount of property bought by foreigners is bought pre-construction from developers. Property fairs are a popular way for developers to present their proposals and meet potential buyers. These property fairs are held all over the world, so look for one visiting a city near you. Have the required ID and visa documents. Since a change to the law in 2002, it has become possible for foreigners to buy and rent Dubai freehold property. You will, however, still need to present a valid passport to prove your identity. You are not required to hold any type of residency permit in order to buy property, but assuming you want to stay there you will have to have this available. This allows foreign investors to stay in Dubai for six months while they investigate possible purchases. To qualify for this, the property you buy must have a value greater than 1 million dirhams, which is equal to about $272,000 U.S. dollars. You must be buying as an individual, and not as a company. Determine the full costs. You need to be certain that you can afford the property and meet all of the costs attached to the purchase. When you are determining the overall cost of the property you should include the purchase price, the deposit, transfer fees, real estate agent fees and the potential for currency exchange rates to fluctuate. It is not legally necessary, but it is highly advisable to employ a lawyer to help you negotiate all the paperwork. Mortgages in Dubai are paid in monthly installments, with 15 year terms the most common. Residents of India cannot mortgage their property in Dubai and raise loans. Indian residents are also not permitted to give a guarantee to any loan from a non-resident. The maximum length of mortgage term in Dubai is 25 years. As foreign exchange can be tricky, it is advisable to obtain professional advice before deciding to take out any mortgage in a foreign currency. Mortgage rules have been known to change in Dubai, so try to keep up-to-date by consulting local news and the Central Bank of the UAE. Submit an application form to the Developer. If you are buying pre-construction property, the first step once you have decided on the property you want and secured all the financing, is to submit a completed builder’s form. This form will summarize the basic terms and conditions of the sales agreement, including information on the payment plan, and personal information from all parties. Pay the deposit. Once the reservation document has been accepted you will have to pay the reservation deposit. The amount will be stipulated in your application, but it will typically range between 5% and 15% of the purchase price. Developers will often not draw up the official sales and purchase agreement until this deposit has been paid, and will sometimes charge up to 20% or more. When buying pre-construction, you should ensure that the deposits and payments you make are paid into a RERA-approved trust account. Complete a formal sales and purchase agreement. The formal and legally binding contract is the sales and purchase agreement. Make sure this specifies the date by which the property should be completed, and what penalties the developer will incur if it is delayed. Have a lawyer look over the contract with you, and check all the details, terms and conditions. Transfer of the deed. To complete the purchase there is a transfer of deed into your name. This is the point at which you will be required to pay 100% of the purchase price. The deed will not be transferred, and you will not own the property until you have paid, so you must have financing in place. If the property has been fully completed, the transfer will happen at the Land Department Office. You will then generally be invited to inspect the property and highlight any final issues or deficiencies that the developer needs to address. Sign a Memorandum of Understanding. To purchase resale property in Dubai you must agree to terms with the seller, and record this in a Memorandum of Understanding (MOU). This is a basic document that outlines the terms and conditions, including the price and closing date of the purchase. It is not legally binding, but is a necessary first step to buying resale property. Obtain the deed. Once you have an agreement and financing in place, you can move on and complete the purchase. As an expat you will be required to pay 100% of the purchase price before the deed is transferred, just as if you were buying a pre-construction development. To do this, you may need to attend an appointment at the Land Department and present all the paperwork. The buyer, the real estate agent, and the loan officer from the lender who is financing the purchase may all be required to attend the meeting at the Land Department. We hope you have found this guide to buying Dubai freehold property both useful and interesting.